It was the summer of India’s discontent. In May 1857, Indian soldiers in the East India Company – sepoys, as they were popularly called – revolted against their colonial masters. The spark ignited in Barrackpore, near Kolkata, soon reached Meerut. Delhi, for the sepoys was the next logical step. The sepoys met their former masters outside the gates of Shahjahanabad in September, that year. After days of bitter fighting, the British forces emerged victorious, though not without losses of their own. One of the main casualties of the uprising was Brigadier-General John Nicholson. Known as the ‘Lion of Punjab’, Nicholson was a charismatic figure whose leadership was instrumental in settling the unruly North West Frontier Province (tribal areas now on the border of Pakistan and Afghanistan). Along with Nicholson perished many other Christians. 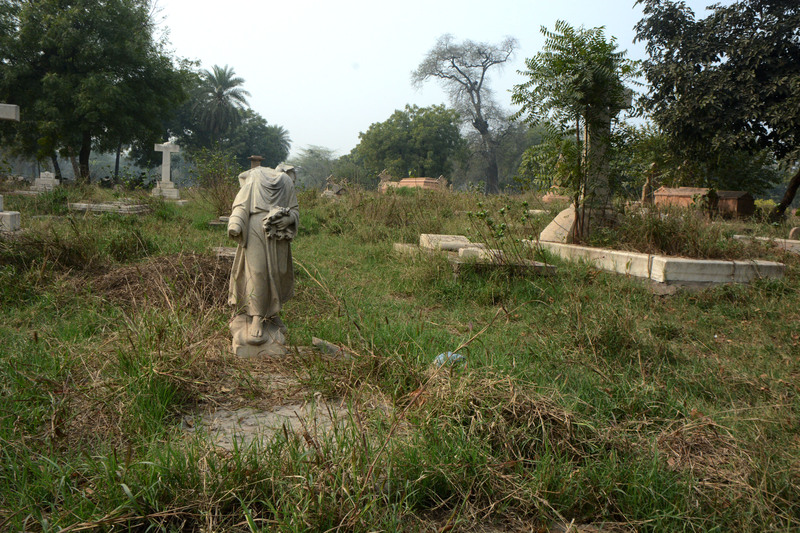 In fact, the numbers of those killed in the uprising were so large that there was an immediate need for a new cemetery. 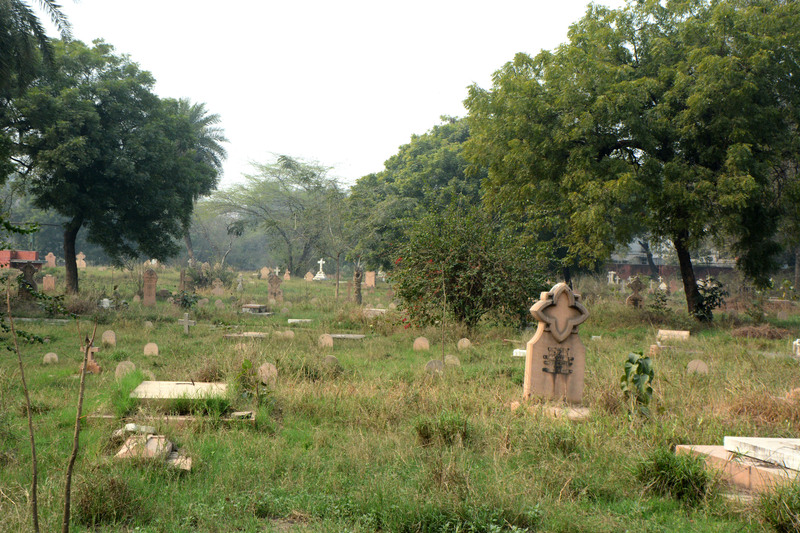 The area right outside the Kashmere Gate, which has seen some of the bloodiest pitched battles, was chosen as the spot to commemorate the dead. Nicholson was one of the first to be buried in it. Along with his mortal remains, he also gave this patch of land its name – the Nicholson Cemetery. That was then. 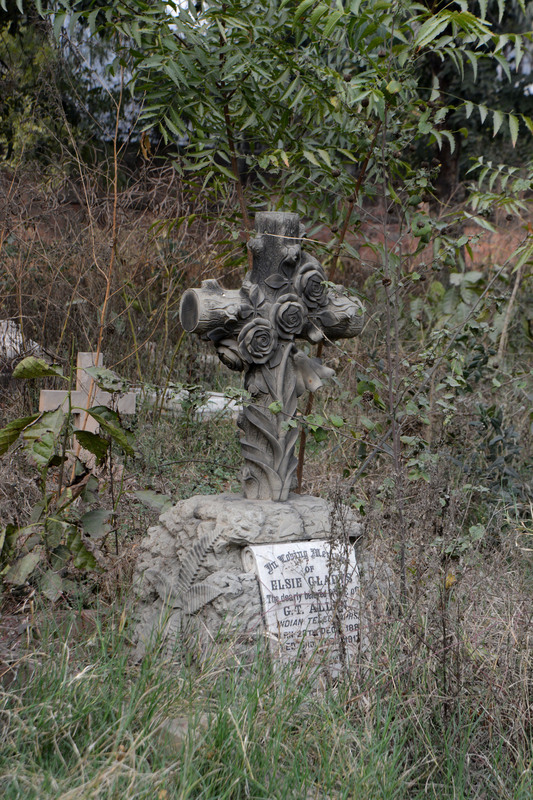 The Nicholson Cemetery of 2015 is an oasis of calm in the middle of Delhi’s transit district. It will take you a minute to get used to the sight of a metro train zooming overhead as you try to read the epitaph of a tomb from the 1860’s. 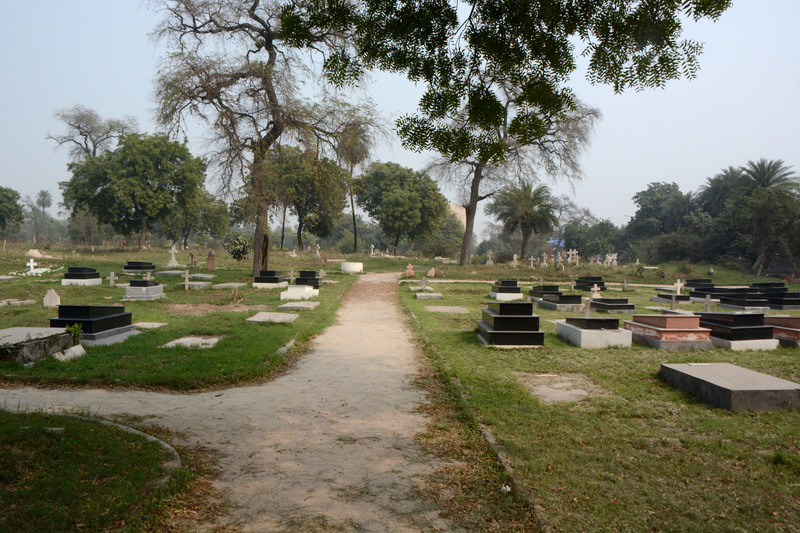 The cemetery today is clearly divided into two parts. The grassless, almost barren, somewhat tidy part which still inters the recently departed and the wild and overgrown remainder which is older and, needless to say, more atmospheric. 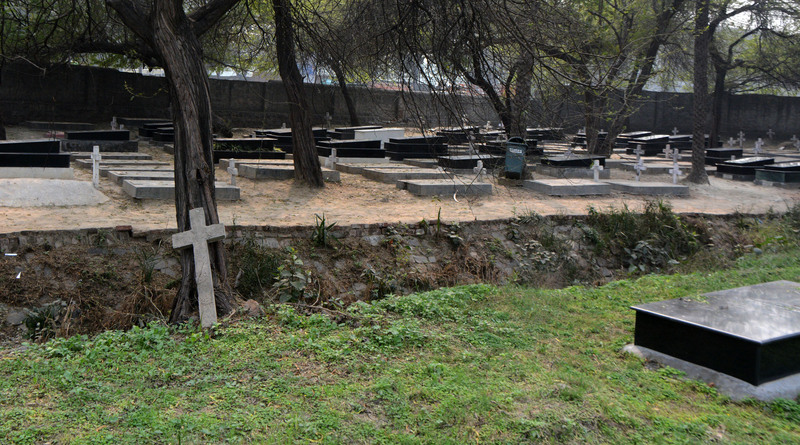 The graves in the newer part of the graveyard are more or less similar. Neatly laid out, rarely with a headstone, almost always capped by a black granite tombstone. 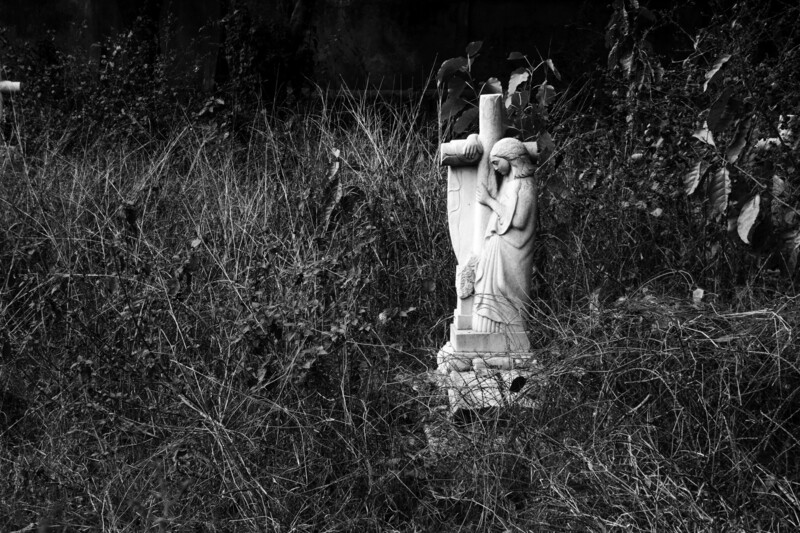 Every now and then, an old grave pops up – a visitor from a different time, in a different space. 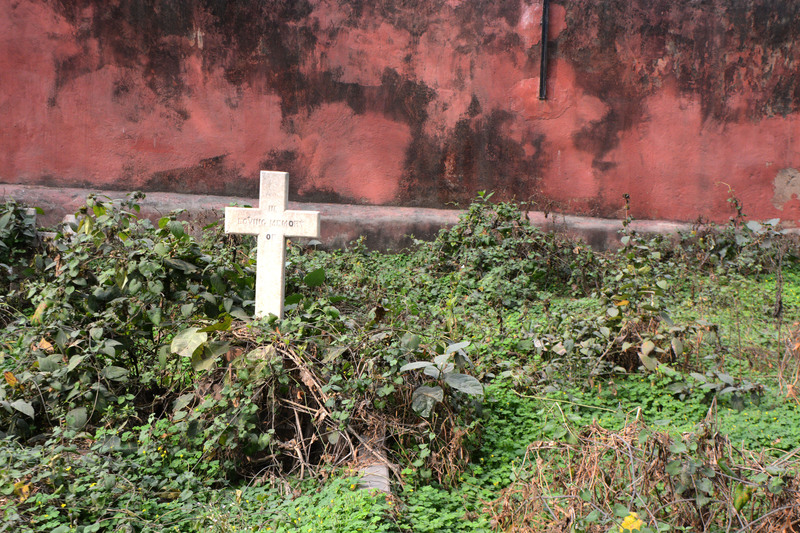 Walking among the graves, it is difficult not to notice the overwhelming number of infants and children buried here. Born in an alien land, a land of heat and dust, of malaria and cholera, very few children lived beyond the age of five. The Raj, it seems, paid a terrible price for its fortunes. A large number of graves are also marked Deo Notus: ‘known only to God’. These are the graves of soldiers who died anonymous, an overwhelming majority of whom perished in the Battle of 1857. 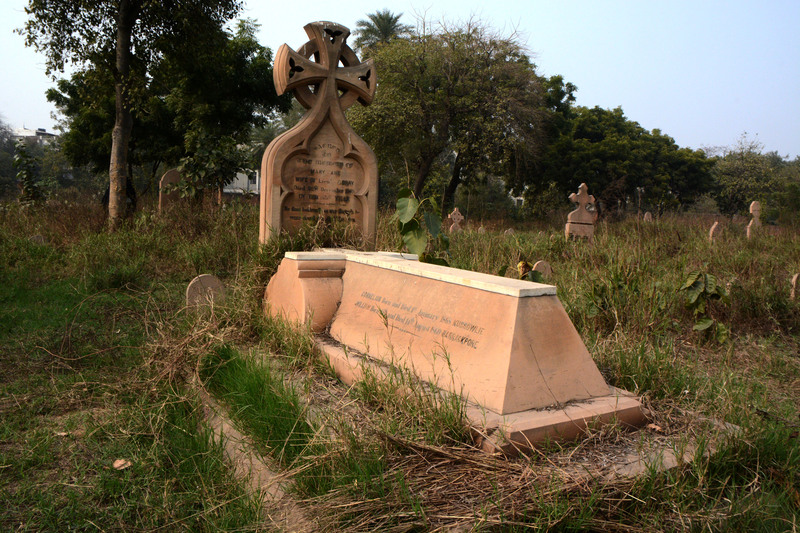 There are also those who died fighting in various other outposts of the Raj – from Rangoon to Peshawar and Gwalior. And then there were people who left this world rich in love. The tombstones often bear words which, even after a century and a half, continue to touch the strings of your heart. As I walked past one forgotten corner of the graveyard, a very familiar name appeared on a tombstone. 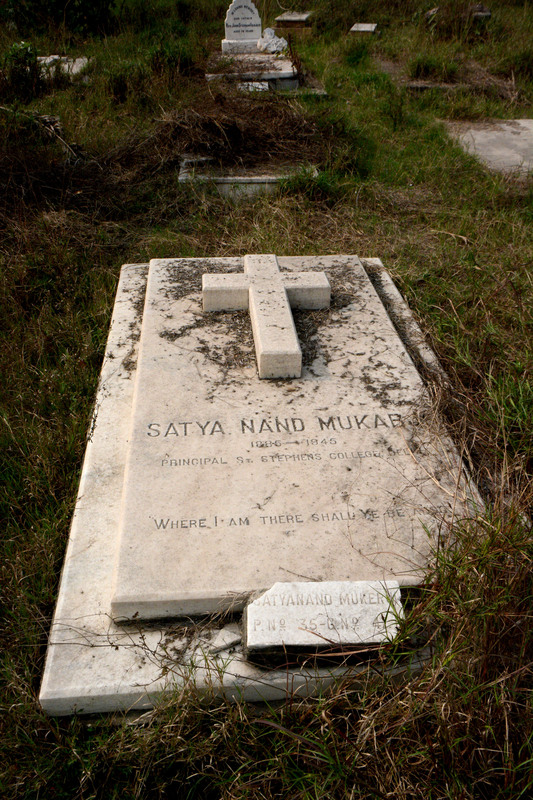 It was the final resting place of Satya Nand Mukarji, the sixth principal of St Stephen’s College, my alma mater. He taught in the college from 1912 onwards, serving as the Principal from 1926, until his death in 1945. The hostels in St Stephen’s College are named after past principals; I happened to have spent four of the best years of my life in Mukarji West. We end where we began – at the tomb of John Nicholson, one of the few protected by cast iron railings. 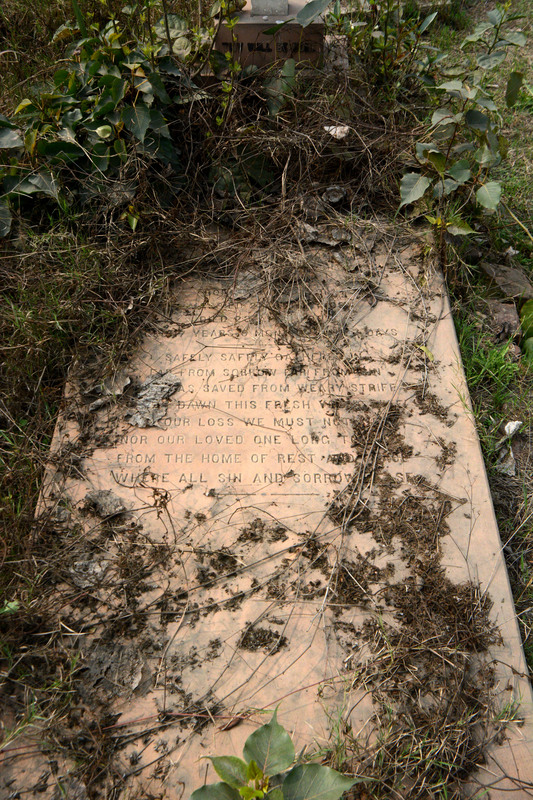 The life and exploits of the Lion of Punjab lie summarised on a marble slab, looted from a Mughal Garden in Delhi in what is a somewhat fitting idiom of British rule. Some say that, even now, on dark moonless nights, a headless Nicholson can be seen galloping through this necropolis on his otherworldly steed. Curious, considering Nicholson was shot in the chest and died with his head still attached to his torso! A few months back, our organisation, Good Earth Publication received the bid to produce a coffee-table book on the monuments of Delhi from the Archaeological Survey of India (ASI). At the behest of the protectors of Indian antiquity, the book was to be very imaginatively titled “Monuments of Delhi”. It was to be released on the occasion of the Commonwealth Games, and possibly was the only project that was completed and delivered well before the start of the event (if it takes off at all, that is). A coffee table book means more photographs and less words but sadly i was given the task to shoot only the smaller monuments while the task to capture the more significant ones like Humayun’s Tomb, Qutb Minar, Red Fort etc, were given to reputed free-lance photographers. But i toiled, nonetheless, in the pre-monsoon sun, which is one of the worst times to shoot monuments. Everything is dirty and the sky, for most part of the time remained a dirty shade of white. So every time there was the rare pre-monsoon shower, i remained on the tenterhooks, scooting off as soon as the rains ended and the clouds cleared to reveal a bluish sky. My first destination was the tombs of Dadi and Poti. 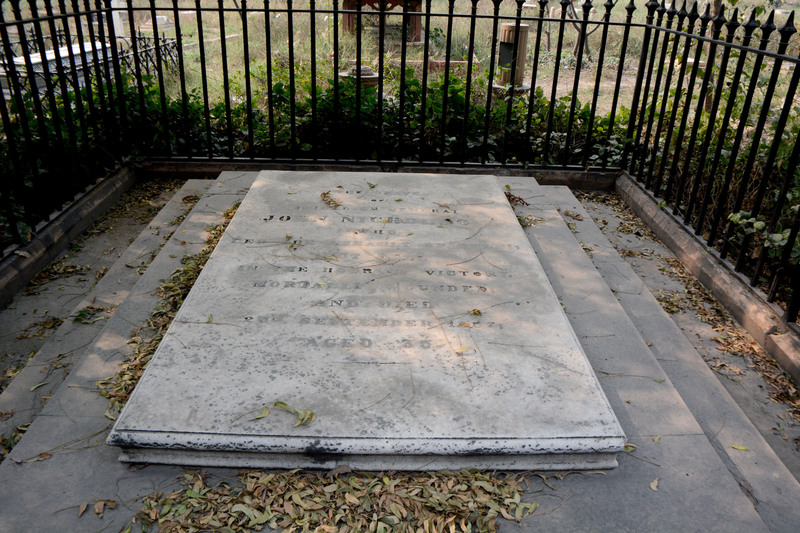 They are amongst the many tombs in Green Park, an area north of Hauz Khas village. 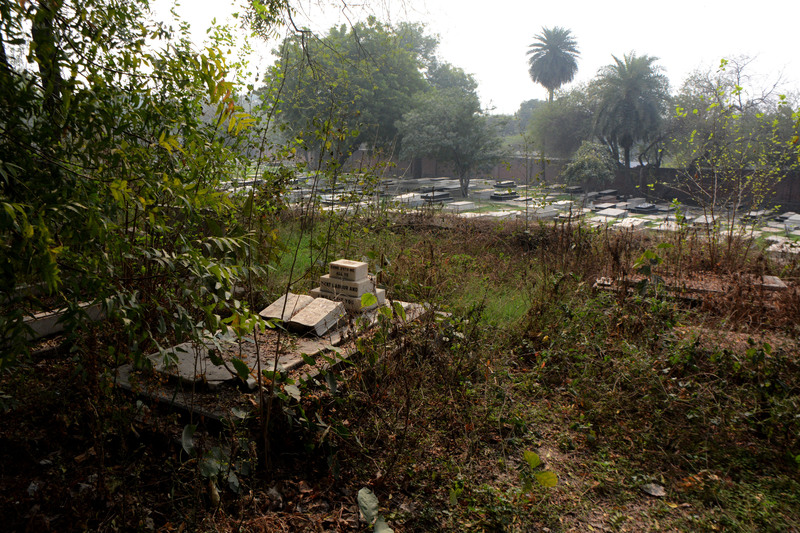 Set side-by-side on a slight elevation along the road that leads from Aurobindo Place to Hauz Khas, the tombs of Dadi and Poti are well-preserved, though the identity of those buried within remains unclear. 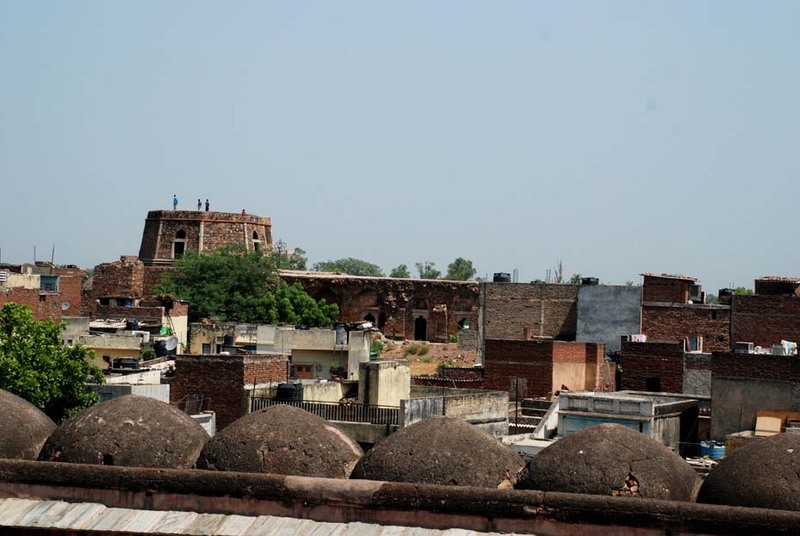 The larger of these buildings is known as the tomb of Dadi (grandmother) or Biwi (mistress), and the smaller as that of Poti (granddaughter) or Bandi (maid-servant). Both tombs are built of rubble and plastered, and both follow the square pattern characteristic of Lodi tombs: with openings to the east, north and south, and their façades broken into a semblance of ‘storeys’. The western walls of both tombs are closed with mihrabs, but only the tomb of Dadi rests on a plinth. My next assignment took me to Begumpur Village, near Sarvapriya Vihar. 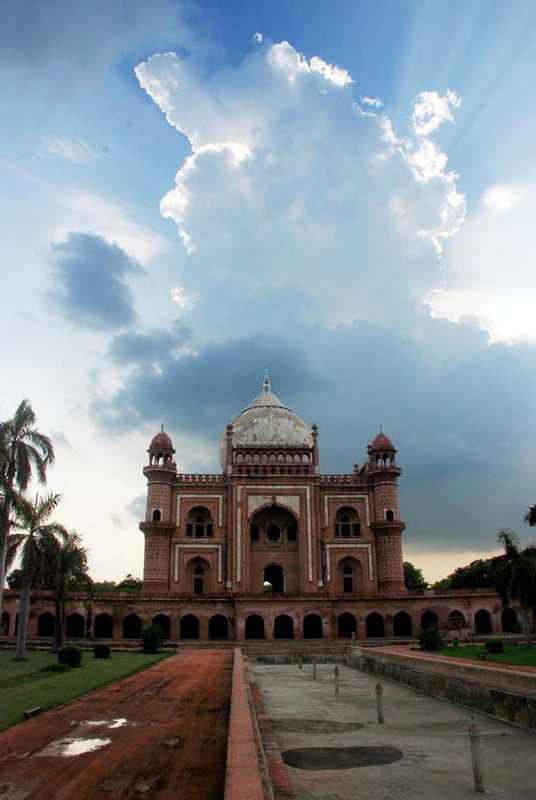 It has has two Tughluq era monuments of immense archaeological significance. Of these, the Begumpuri Masjid is best preserved, while the ruined palace known as Bijay Mandal is unfortunately dilapidated. 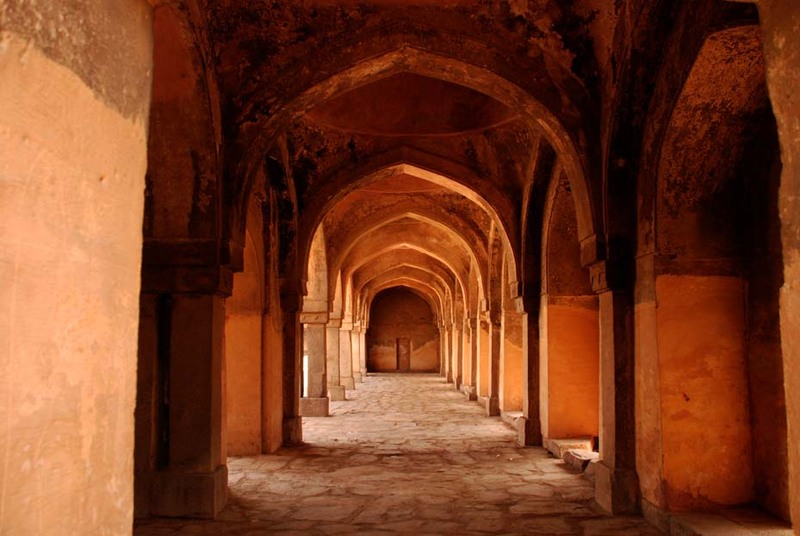 Over the years, the village of Begumpur has been engulfed within New Delhi’s ever expanding city limits, but the Bugumpuri Masjid remains quite spectacular still. 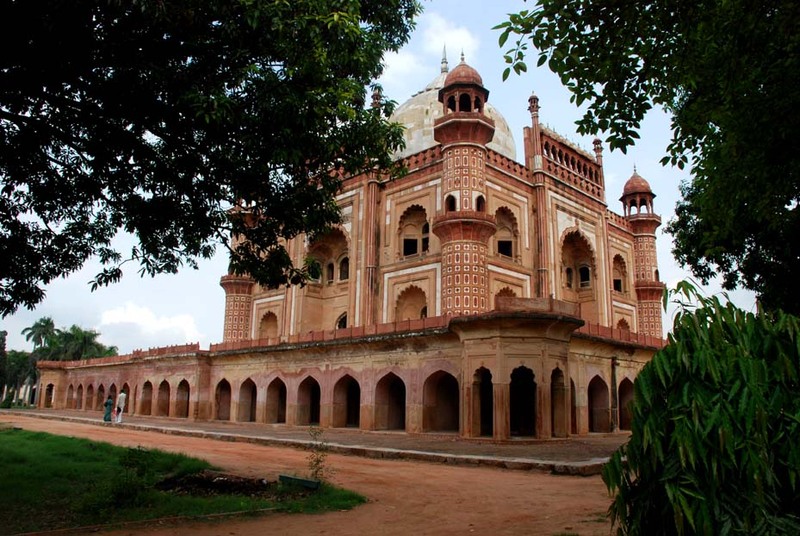 It is generally held that Begumpuri Masjid is one of the seven mosques built by Khan-i-Jahan Junan Shah, the prime minister of the great builder and restorer, Firuz Shah Tughluq. Its large, paved courtyard is enclosed by arched cloisters to the north, south and east. To the west is the sanctuary of the mosque, which is three aisles deep. The entire structure rests on a high plinth. 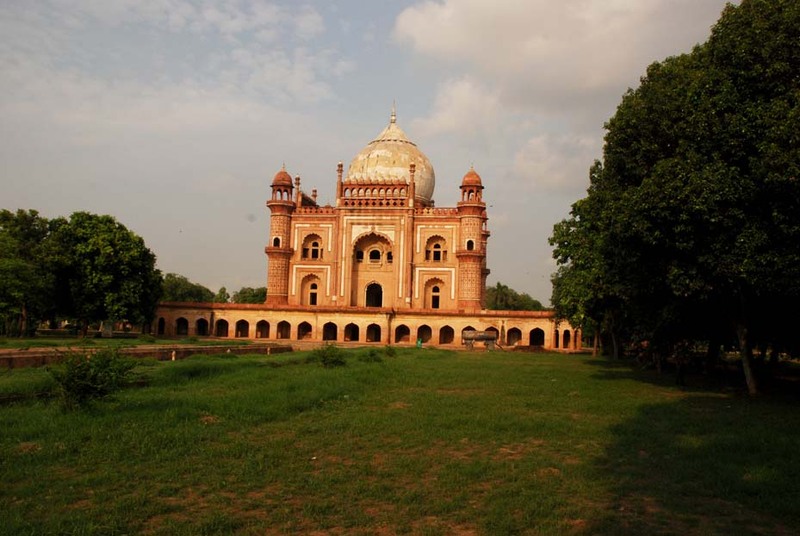 Begumpuri Masjid, to this day remains the largest mosque in Delhi after the Jami Masjid in Old Delhi. The façade of the prayer hall is broken by 24 arched openings and is flanked by tapering minarets. Of the arches, the central one is the highest, and the building’s most prominent feature. 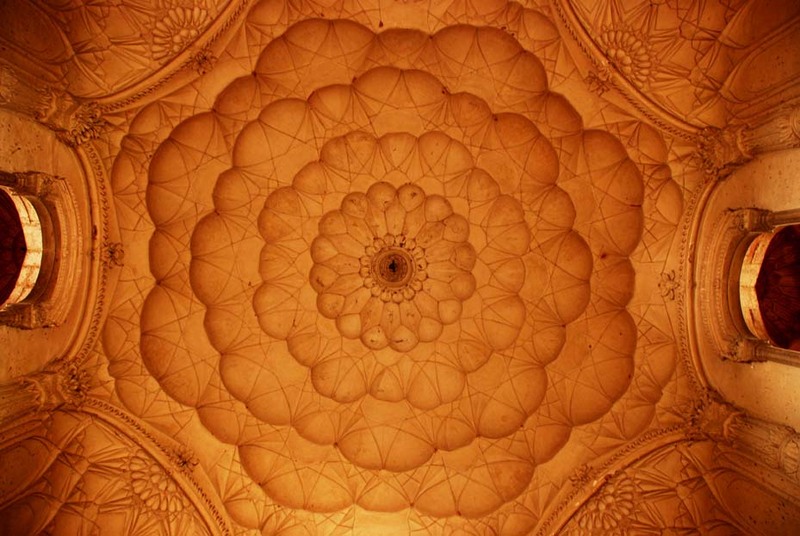 The prayer hall’s central compartment is surmounted by a large dome, while smaller and lower domes rise along the roof from the central aisle and from the corridors. The main entrance to the mosque is to its east, through a domed gateway, reached by a flight of steps. 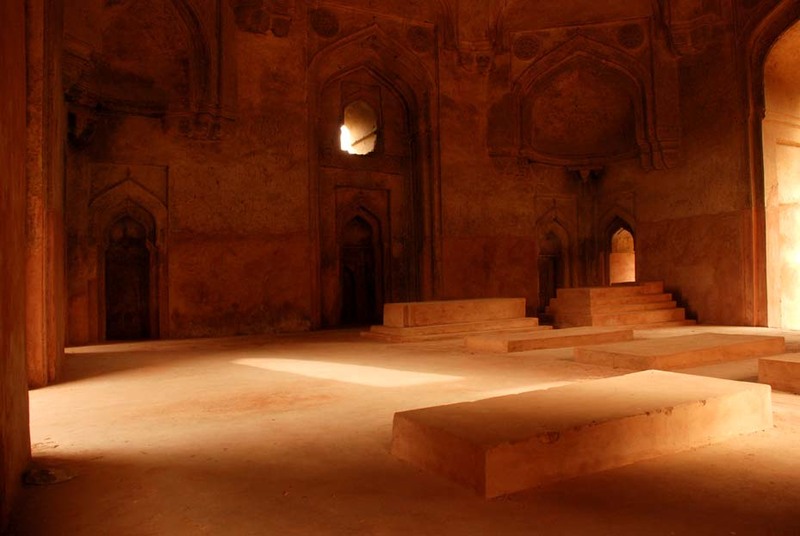 Within, the Begumpuri Masjid has five mihrabs, and it has been conjectured that it might have once been connected to the Bijay Mandal. Children playing in the mosque posed for this one! 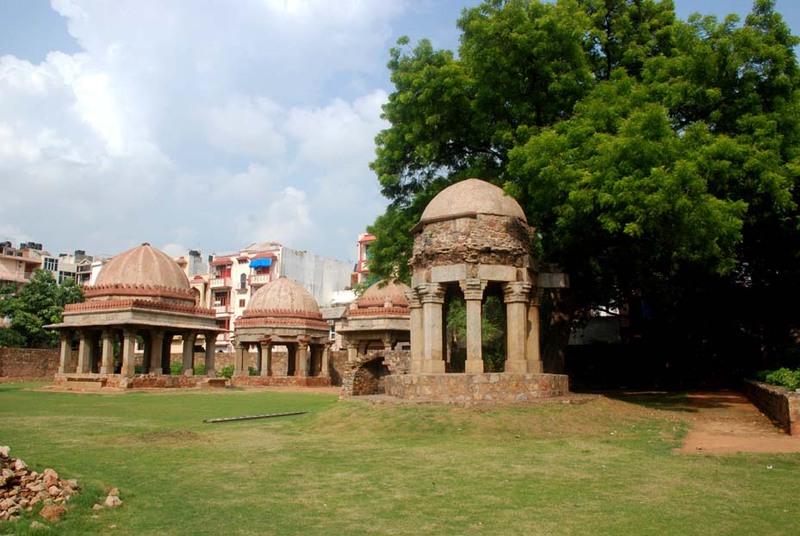 Lal Gumbad, an elegant Tughluq-period structure, is located south of Panchsheel Park, on the road leading to Malviya Nagar. 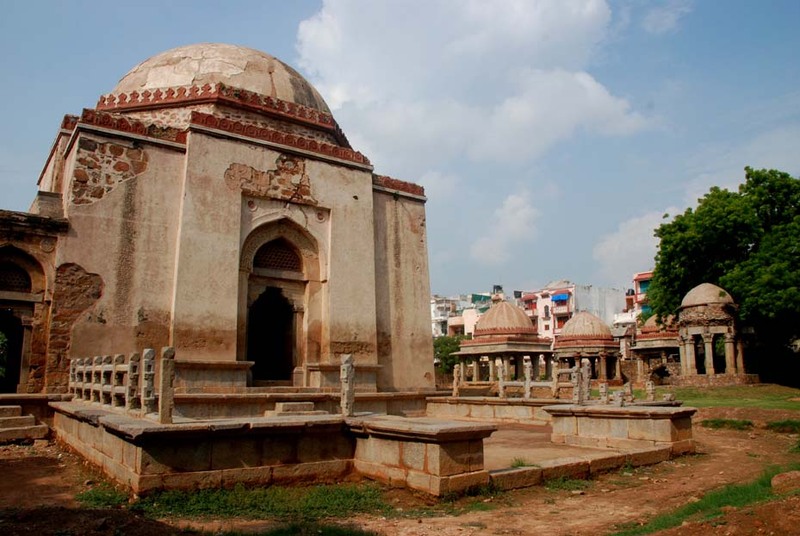 Dated to about 1397, this is the tomb of Shaikh Kabiru’d-Din Auliya, a disciple of the Sufi saint Shaikh Raushan Chiragh-i-Dihli, whose dargah is in the urban village of Chiragh Delhi, barely a kilometre east of Lal Gumbad. Chiragh-i-Dihli himself was a disciple of Shaikh Nizamu’d-Din Auliya, whom he succeeded as the head of the Chishti sect. Lal Gumbad is entered through a pointed arch on the east, decorated with marble bands, which faces the mihrab on the western wall. Within, its northern and southern walls are adorned with intricate sandstone jaali screens. East of Lal Gumbad is a smaller domed building, which probably served as the gateway to the tomb enclosure. 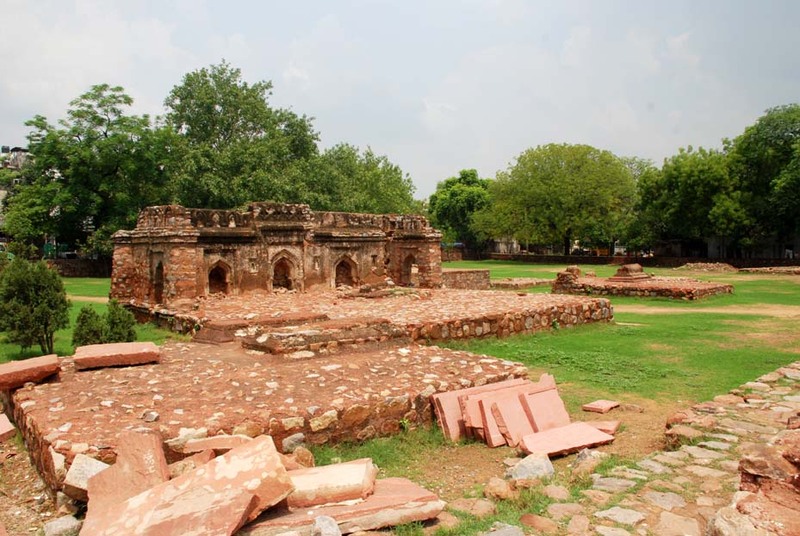 The Khaljis came to rule Delhi in 1290, and so turbulent were these times that only six years later the third king of this dynasty, Alau’d-Din Khalji, ascended to the throne, and was responsible for building the second city of Delhi. This was the city of Siri, which Alau’d-Din Khalji began building in 1303, and it was also the first originally Islamic city of Delhi. Little remains of it now because the city was destroyed by Sher Shah Suri, who used the rubble to build his own city, Shergarh. 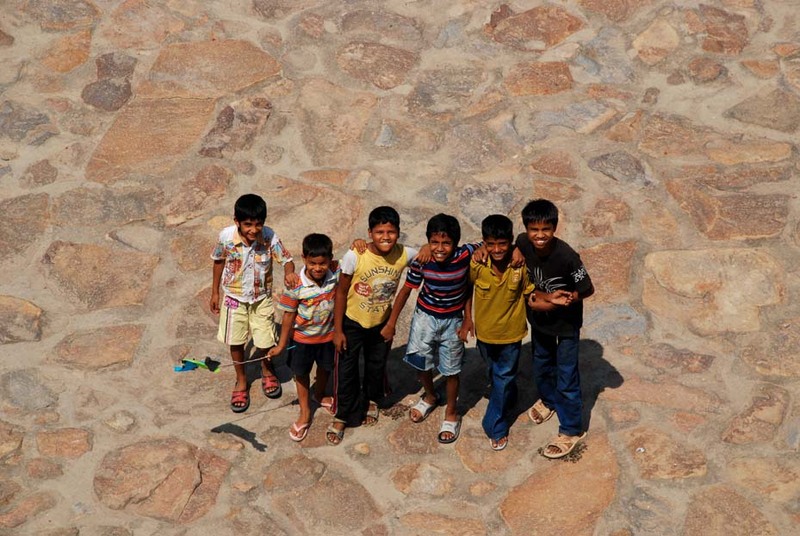 What survives are some stretches of thick stone walls near Panchsheel Park, the Asiad Village and Khel Gaon Marg. These walls still have some bastions, some holes through which to shoot arrows, and battlements shaped like ‘flames’, a feature that makes its first appearance here. 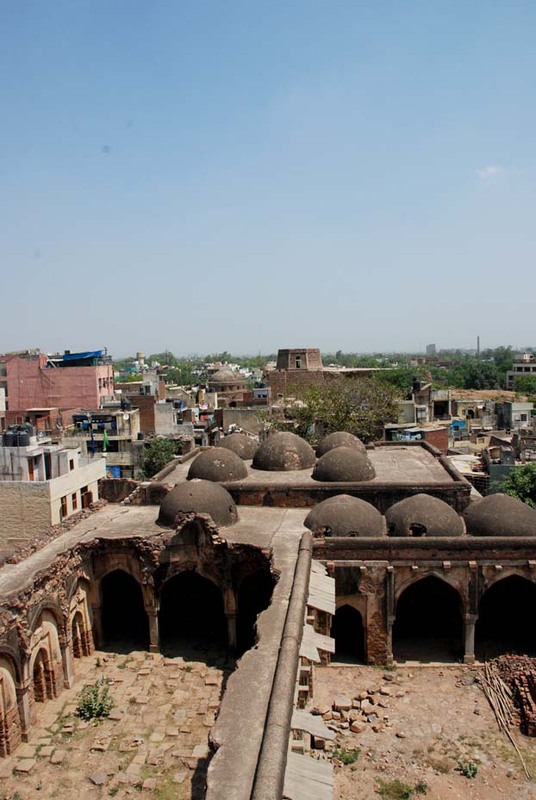 Nothing of the palaces within has survived, though there are a few derelict buildings in Shahpur Jat, a village near the Siri Fort Sports Complex, from this period. 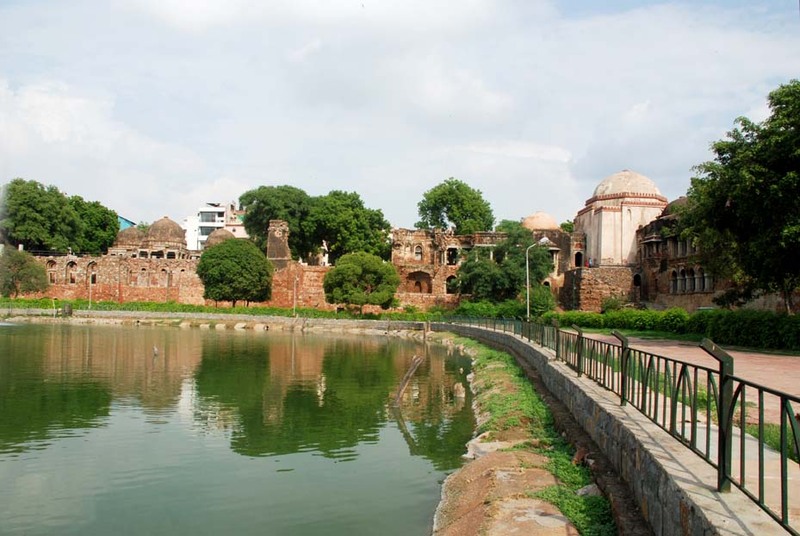 The nearby Hauz Khas reservoir (later in the post) was dug by Alau’d-Din Khalji, and originally called Hauz-i-‘Ala’i. Its waters served the needs of Siri’s inhabitants. According to the medieval traveller Ibn-Battuta, Alau’d-Din Khalji was not just a great builder but ‘one of the best of sultans, and the people of India are full of his praises’. 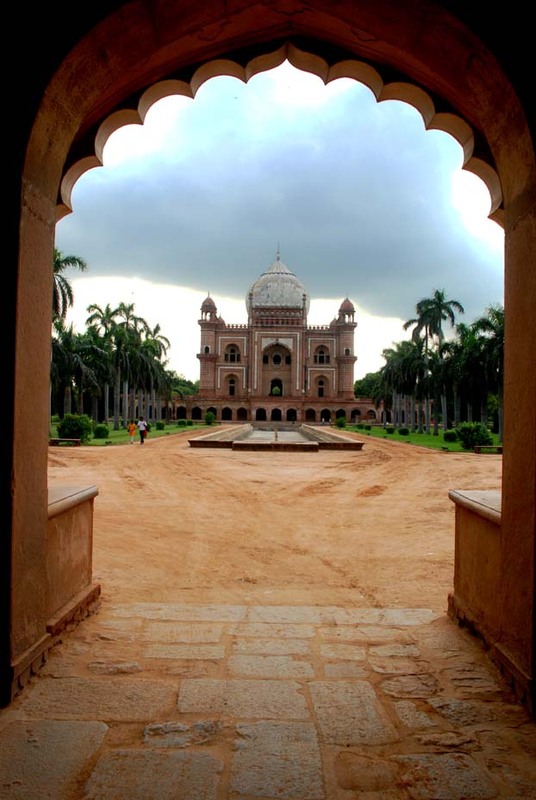 Besides Siri, Alau’d-Din Khalji also built the beautiful Ala’i Darwaza near the Qutb Minar. 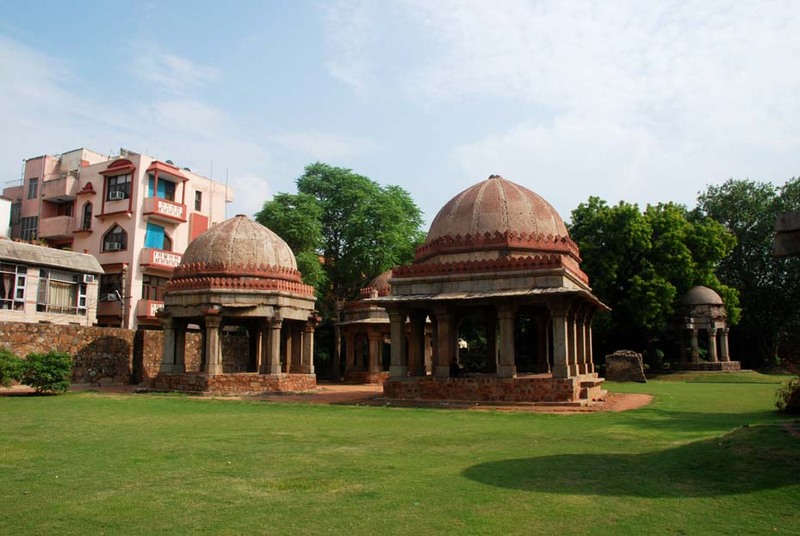 On the peripheries of the old city of Siri is a monument that dates to a much later period, when Delhi was ruled by the Lodi dynasty from 1451 to 1526. 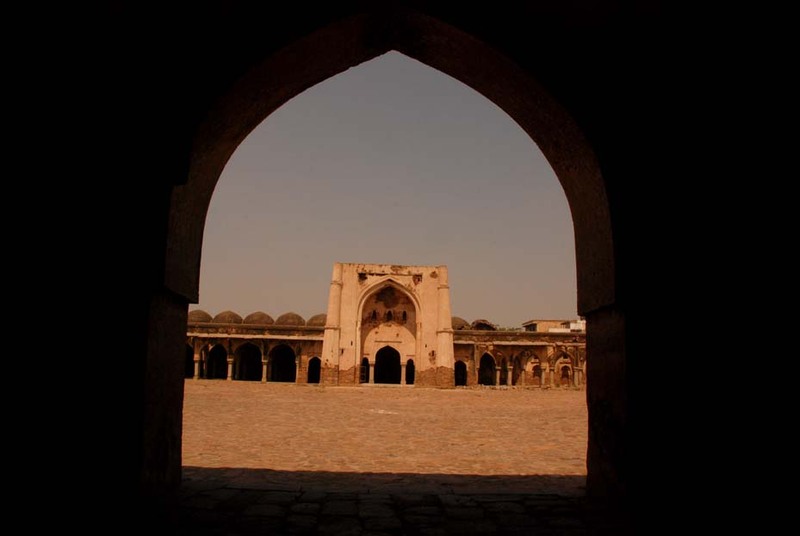 Set within an enclosed courtyard, the Muhammadwali Masjid can be found just north of the entrance to the Siri Fort Sports Complex. There is a gateway made of dressed stone leading into the courtyard. Within, the prayer chamber of the mosque has three bays, the middle one of which is domed. The eastern façade of the building contains arched niches in red sandstone and one can still see vestiges of the blue tiles that once decorated the wall. Further decoration remains on the ceiling, which has patterns of intersecting red bands on it. 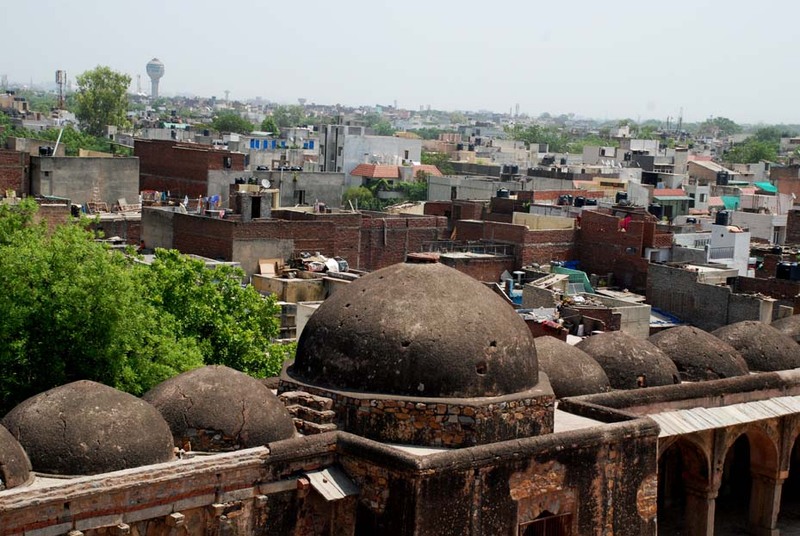 Originally, the mosque had chajjas (eaves) as evidenced by some extant brackets. When Alau’d-Din Khalji built the city of Siri, in 1303, he also excavated a vast tank to provide water for his subjects. 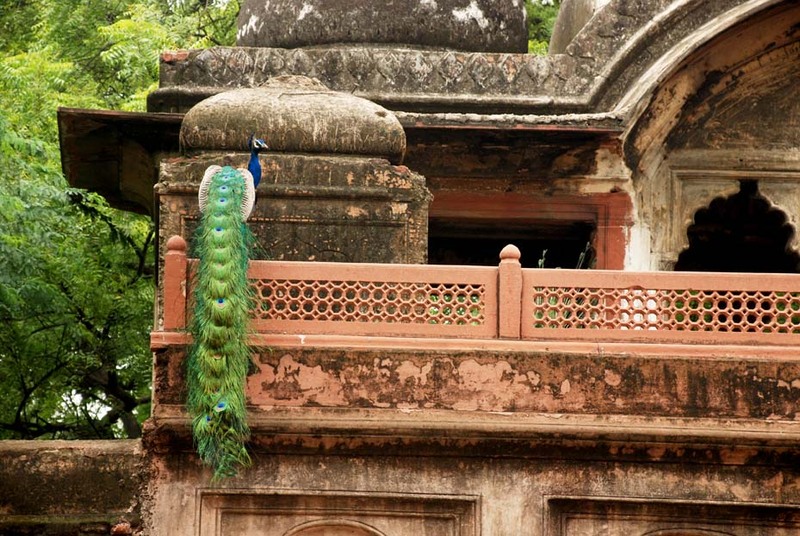 Originally named Hauz-i-Ala’i, it is now called Hauz Khas. A medieval alcove surrounded by modern bustle and construction, Hauz Khas is located just off Aurobindo Marg, south of Green Park. 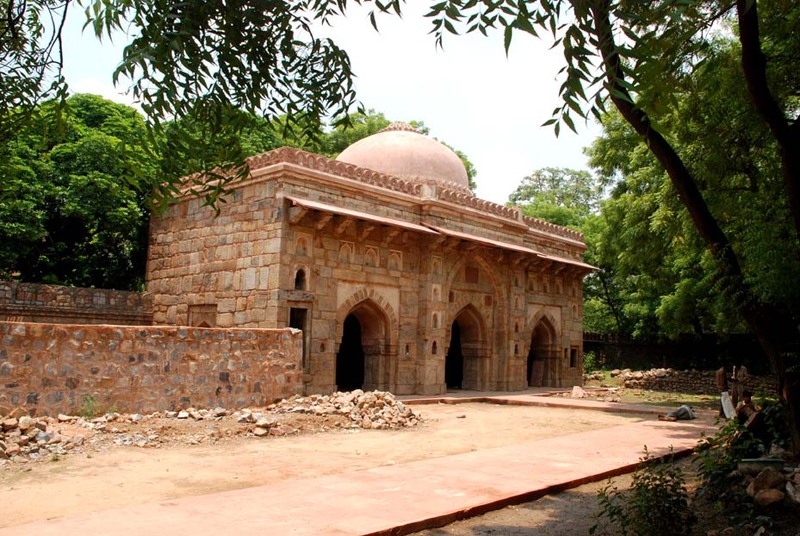 Half a century after Alau’d-Din built the tank, Firuz Shah Tughluq gained Delhi’s throne, taking great pains to restore and expand many of the monuments built by previous dynasties. 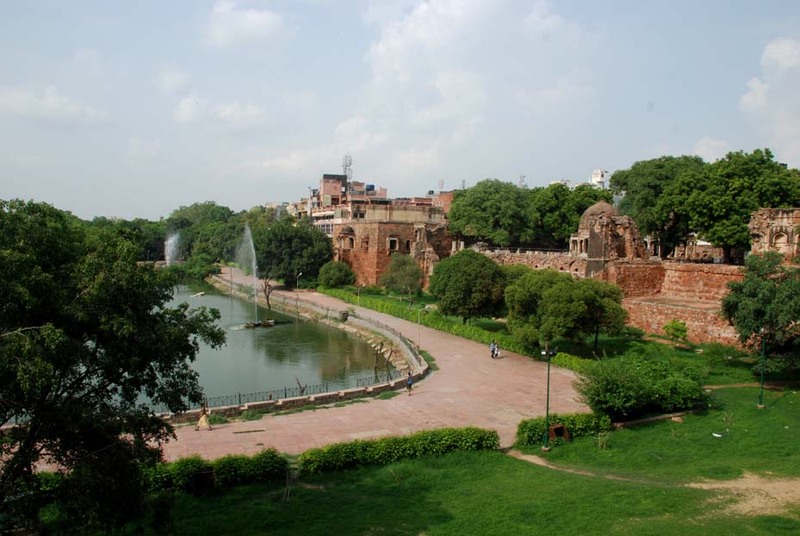 Not only did he de-silt Hauz Khas but he also erected several buildings along its eastern and southern banks. So great were the proportions of Alau’d-Din Khalji’s tank that even the conquering Mongol, Timur, who blazed through Delhi at the close of the fourteenth century and pitched camp by these waters, was impressed. It is ‘so large,’ he wrote, ‘that an arrow cannot be shot from one side to the other’. 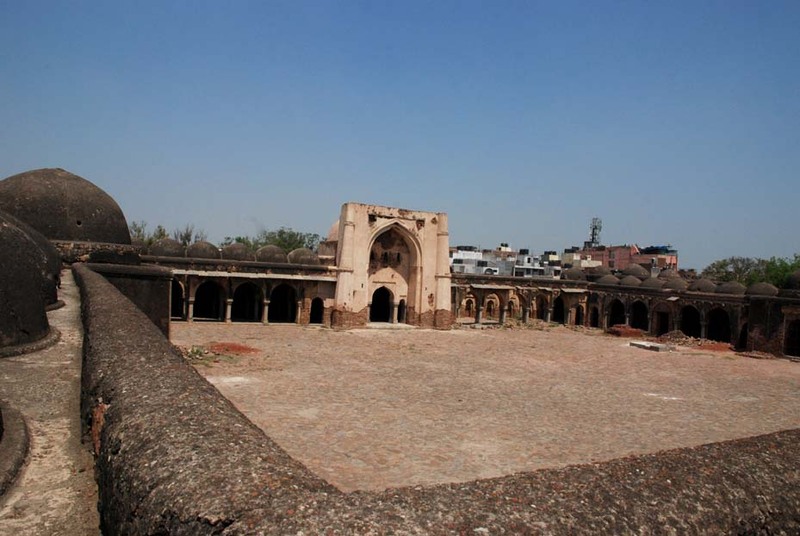 A century after the tank’s construction, it was still fulfilling it’s original function, for Timur went on to note that it ‘is filled with rainwater and all the people of Delhi obtain water from it year round’. The tank that exists today was built by the Delhi Development Authority and, though pleasing and inhabited by a variety of waterfowl, bears little resemblance to the original and almost a quarter of its original size. 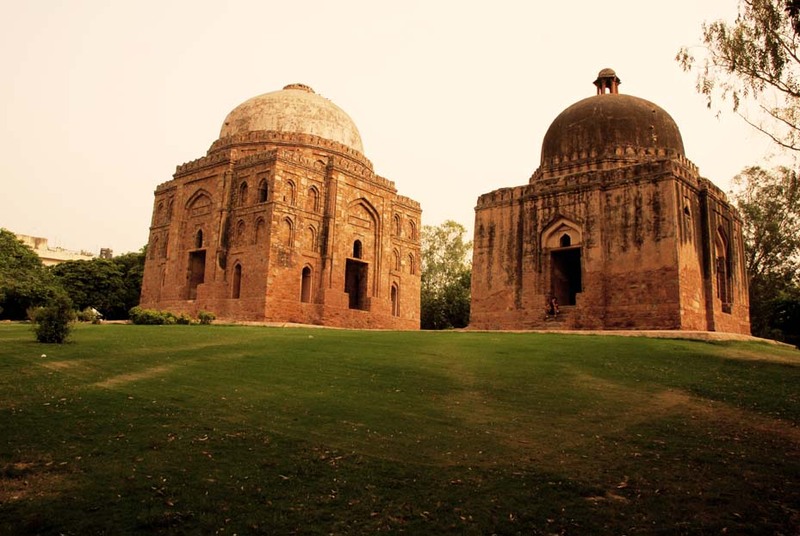 The most prominent structure in the Hauz Khas complex is Firuz Shah’s tomb, a square chamber built on a low plinth and surmounted by a lofty dome. The tomb’s entrance is to its south, while its northern and western walls have narrow arched openings leading to adjacent buildings. Its eastern and southern façades are each broken by an archway, which acts as a door. Over the southern doorway, there is an inscription dated to 1507 AD, when the then ruler Sikandar Lodi ordered some repairs to the tomb. There is also a courtyard outside the southern entrance, surrounded by a stone fence that is typical of early Buddhist stupas, and has here been elegantly mingled with features of Islamic architecture. Although the tomb is fairly austere in appearance, the severity of its construction is broken by a decorative panel of red sandstone and marble, and carved battlements. 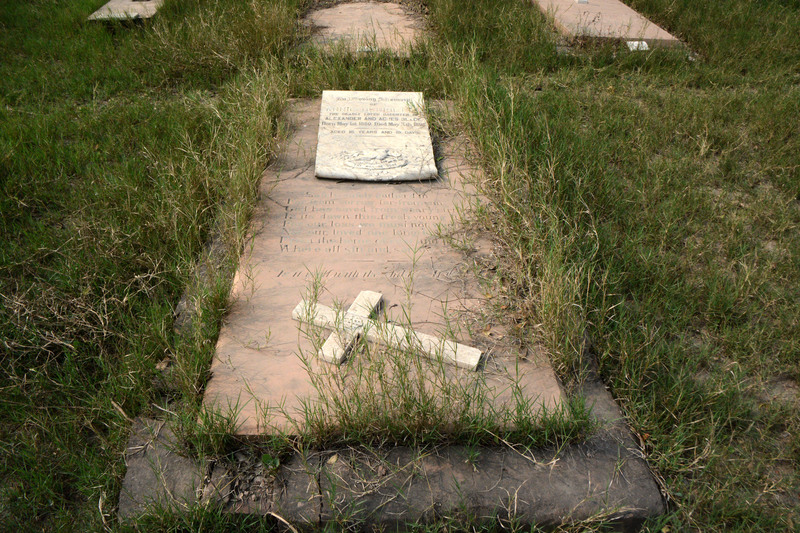 Within are four graves, of which the central one is believed to be that of Firuz Shah, and two others of his son and grandson. 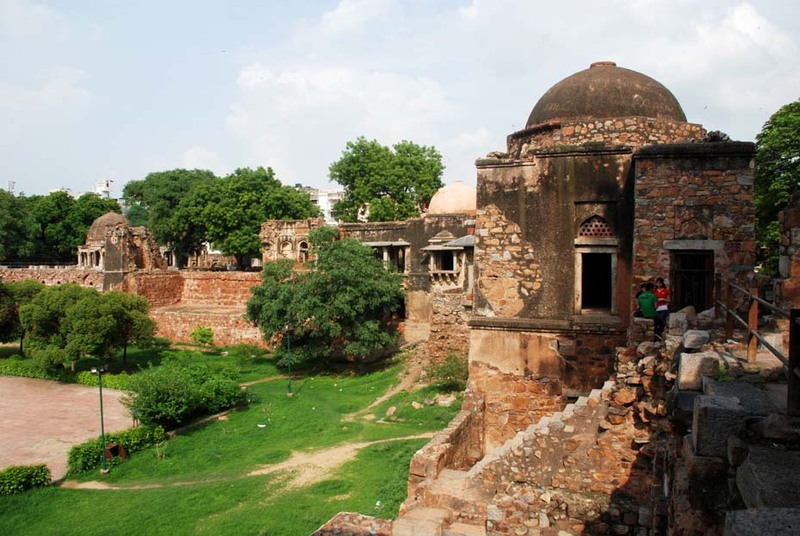 Contiguous with the tomb, to its north and west, are a series of two-storeyed buildings rising along the banks of Hauz Khas. 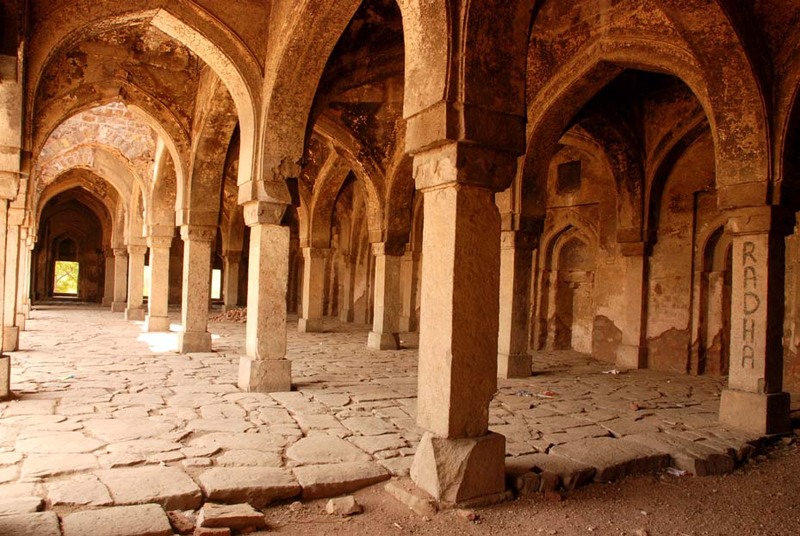 These were built by Firuz Shah as a madrasa (or school of theological learning); and to their north is a mosque. An unusual feature of this mosque is that the obligatory mihrab on its western wall is pierced by arched windows. 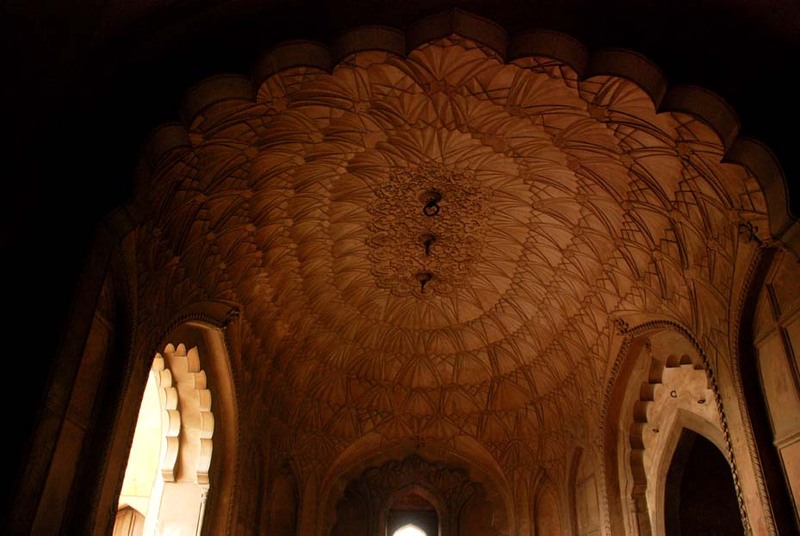 The madrasa, which once attracted both students and teachers from across the Islamic world, is designed in an L-shape, and its many chambers are decorated with latticed windows, medallions in stucco, lotus motifs, painted ceilings, projecting balconies (jharokha) and deep niches. An independent building to the south-west served, in all probability, as the principal’s residence. 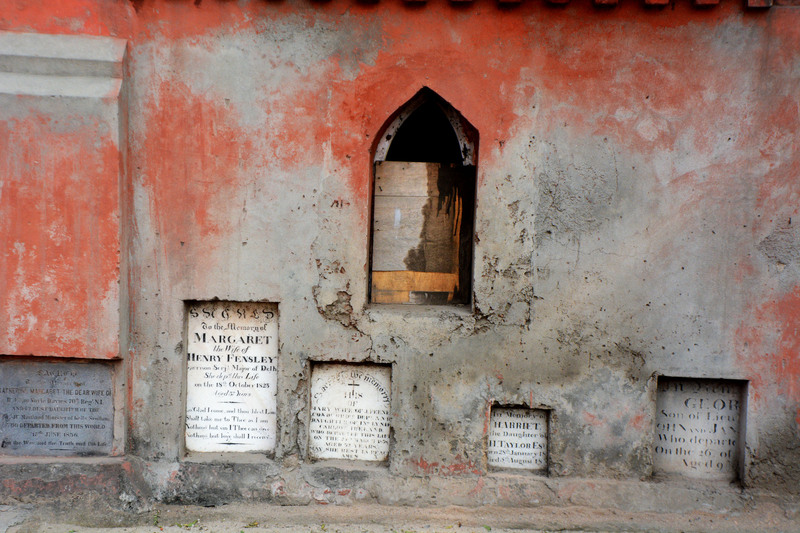 The principal during Firuz Shah’s reign was Sayyid Yusuf, who is buried in the courtyard of the college. There are several other tombs in this area. It is not know who is buried in them, but archaeologists believe that at least some must belong to teachers of the madrasa. Today, Hauz Khas village is a pleasant labyrinth of narrow lanes, many lined with boutiques and popular restaurants. 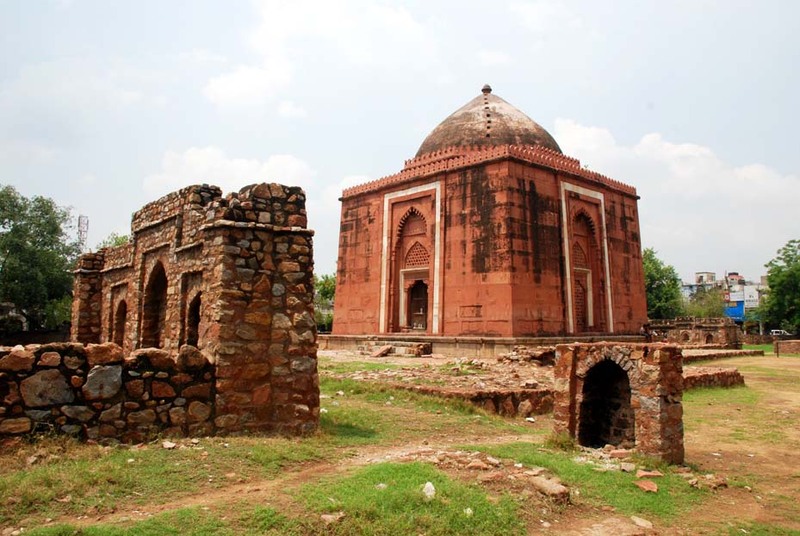 The village also has a Deer Park, which contains the beautifully preserved Bagh-i-Alam ka Gumbad, an early sixteenth-century Lodi tomb. While most of previous assignments were in south Delhi, this one took me to Central Delhi. 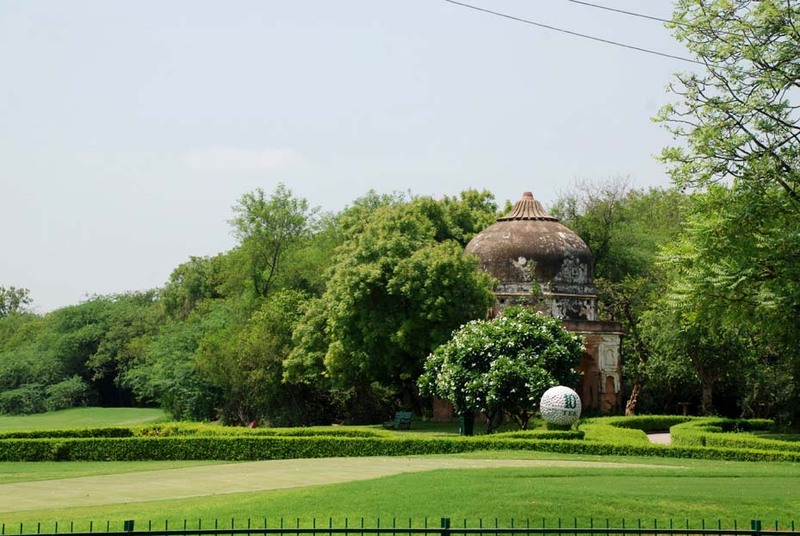 Within the premises of Delhi Golf Club on Zakir Husain Road, are two tombs collectively known as Lal Bangla, or the ‘red bungalow’. 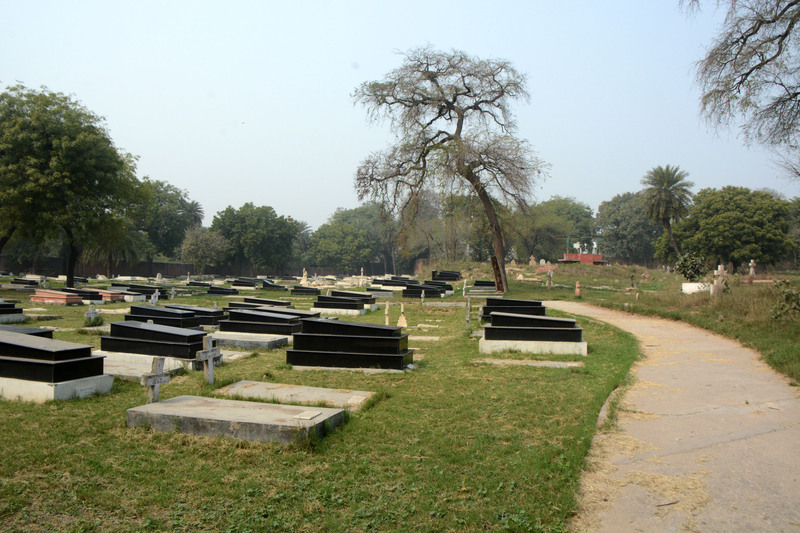 The larger of these tombs is supposed to contain the graves of Lal Kunwar, mother of Shah Alam II (Mughal emperor of India in the latter half of the eighteenth century) and Begam Jan, his daughter. It is uncertain whether the monument derives its name from Lal Kunwar or the profuse use of red (lal) sandstone in the structure. Laid on a similar plan, both tombs consist of a square central chamber with square rooms on the corners connected by halls. Both structures are surrounded by arcaded verandahs, while the smaller tomb, though built on a less elaborate scale, has a disproportionately large double dome. The main gateway to the tomb enclosure is to its south. 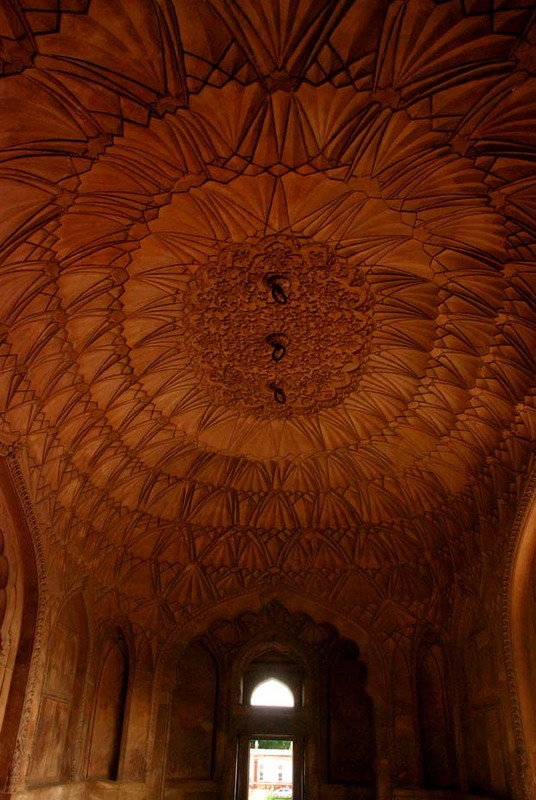 It is decorated with arched niches, sandstone brackets and octagonal chhatris on either side. The bigger of the two banglas! Najaf Khan’s Tomb is located southeast of the tomb of Safdar-Jang, opposite the Safdarjang Airport. Najaf Khan came to India in the early eighteenth century from Persia when the Delhi throne was occupied by the Mughal emperor Muhammad Shah. Later, Najaf Khan entered the service of Shah Alam II and attained a high position in his court. The tomb, constructed by Najaf Khan in his lifetime, is set in the centre of a large enclosure, which has a gateway to the east. The enclosure was landscaped to a Mughal-style charbagh (explained later) garden and has been amazingly restored by the ASI. The mausoleum has bastions on each of its four corners and is entered through a projecting arched entrance on its eastern side. From here, a vaulted passage leads to the central grave chamber. The tomb’s two marble cenotaphs are inscribed and belong to Najaf Khan and his daughter, Fatima, who died in the early nineteenth century. The real graves, however, are in one of the two chambers at the core of the platform on which the mausoleum stands. 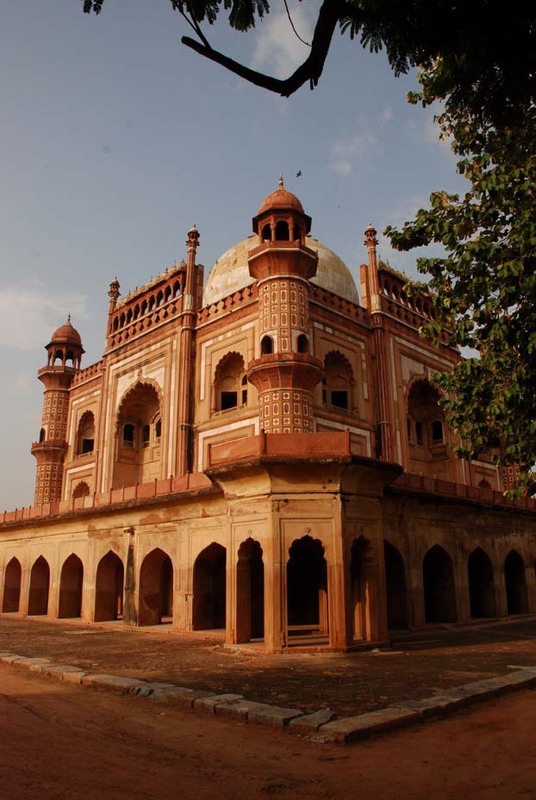 The Mughal tradition of erecting a grand mausoleum in the middle of a garden that started with the Humayun’s Tomb would end in the tomb of Mirza Muqim Abu’l Mansur Khan. Better known as Safdar-Jang, he was the viceroy of Oudh (modern Lucknow) under the Mughal emperor Muhammad Shah (1719-48). 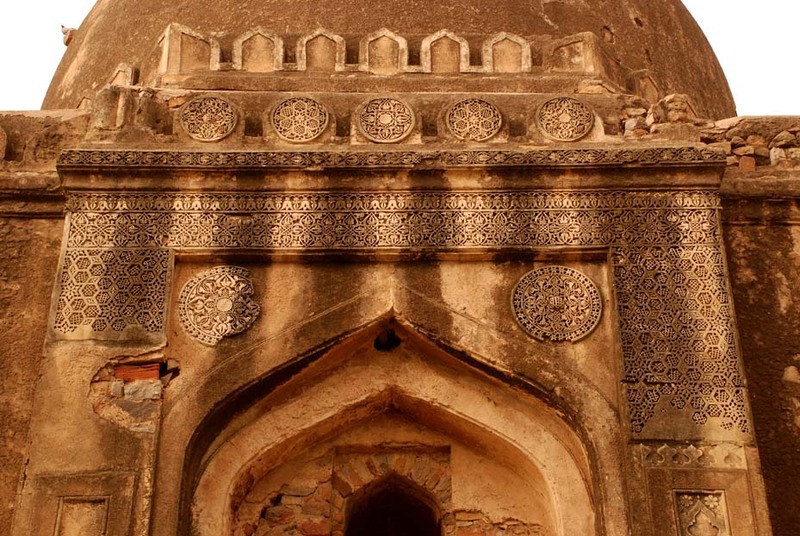 According to an inscription on the eastern entrance to the tomb, it was constructed in 1753-54 by Nawab Shuja’u’d-Daula, the son of Safdar-Jang. The sprawling square garden, which measures 300 m on each side, is enclosed within high walls. These walls, with channels over them to carry water to the various pavilions, contain a series of recessed arches on the inside. 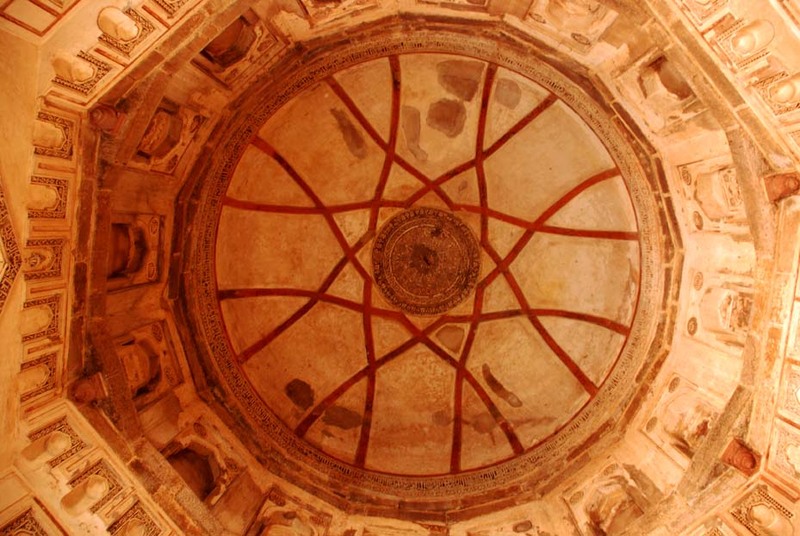 On four corners are octagonal towers, covered by hemispherical domes (chhatris). 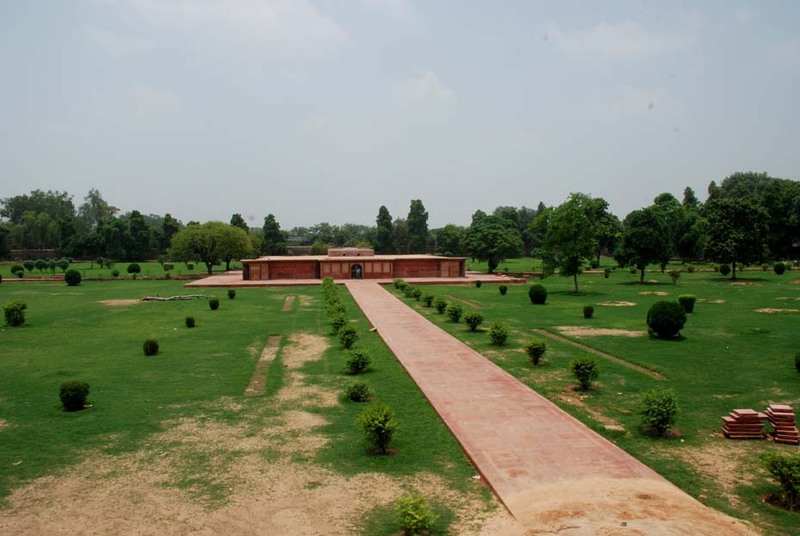 Following the convention of the Mughal charbaghs, the garden is divided into four squares by wide pathways and tanks. Safdarjung’s Tomb srom the main entrance. The complex is entered through an impressive double-storeyed gateway at the centre of its eastern wall. The mosque on its second storey, built of red sandstone, was added much later. 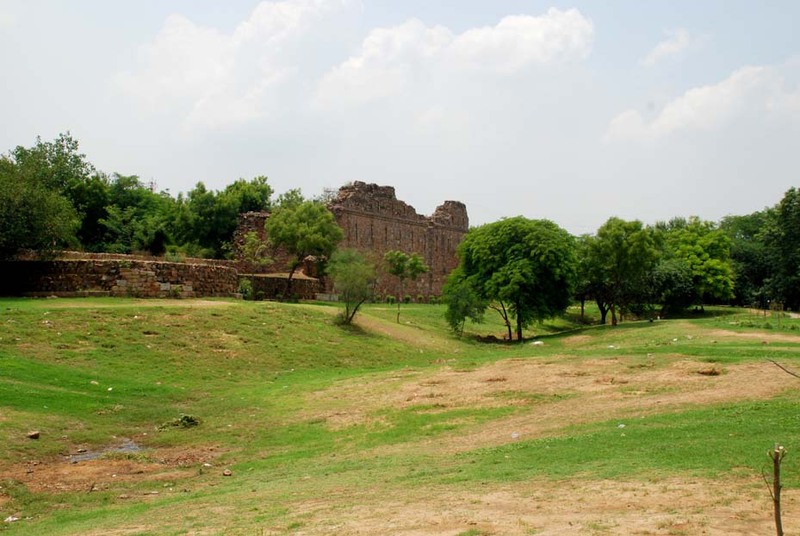 At the centre of the other walls are several multi-chambered spacious pavilions – Moti Mahal (north), Badshah-Pasand, or the ‘king’s favourite’ (south) and Jangli Mahal (west). Safdar-Jang’s tomb stands at the heart of the enclosure. 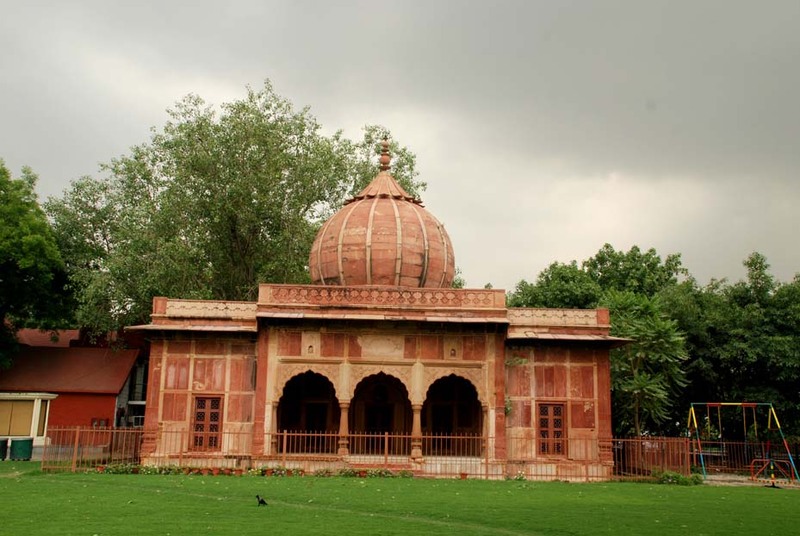 This double-storeyed structure, measuring 18.3 m sq, is built of red sandstone and is lined with white marble. The central chamber of the tomb, directly under the dome is square and is surrounded by eight apartments. The corner rooms are octagonal while the remaining are rectangular. While the central chamber has one cenotaph, the underground chamber directly beneath it has two graves. 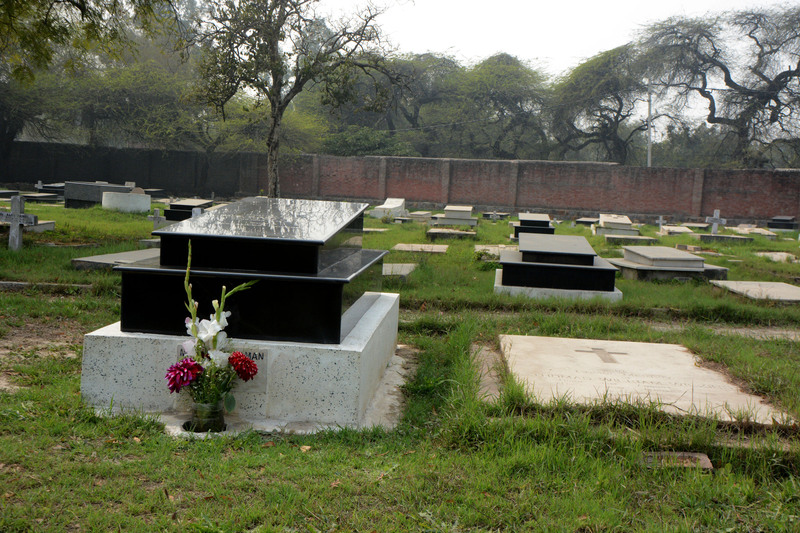 The other grave is presumably that of Safdar-Jang’s wife. The building is capped by a bulbous dome that rises from an octagonal base. The mausoleum rests on a high platform which is faced by a verandah lined with arched openings. On each corner of the tomb are polygonal towers, inlaid with striking designs in white marble and covered with chhatris. The four facades of the tomb are built on similar lines. They have a central cusped arch, framed in marble and red sandstone, through which the tomb is entered. Incidentally, the marble and red sandstone used in the tomb of Safdar-Jang were pillaged from the tomb of Abdu’r Rahim Khan Khan-i-Khanan, located around a kilometre south of Humayun’s Tomb. 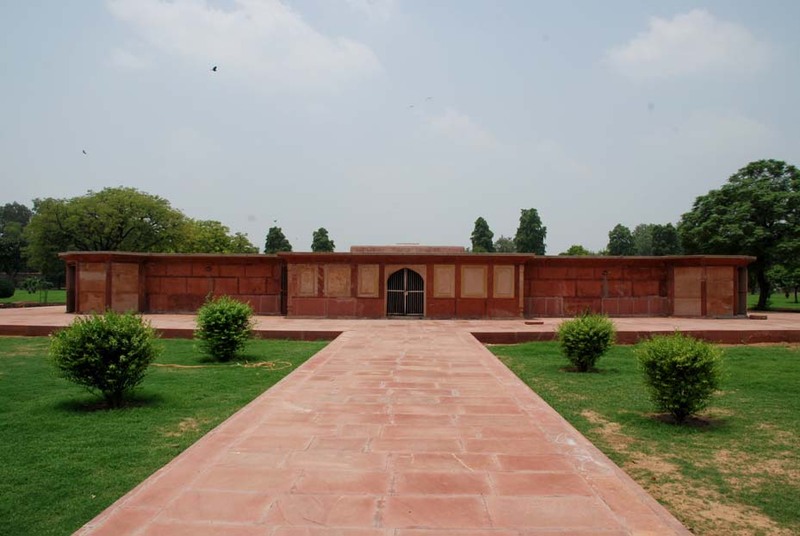 With its large garden enclosure, Safdar-Jang’s tomb is laid out on the pattern of its prototype – Humayun’s Tomb, but is set apart by structural differences. 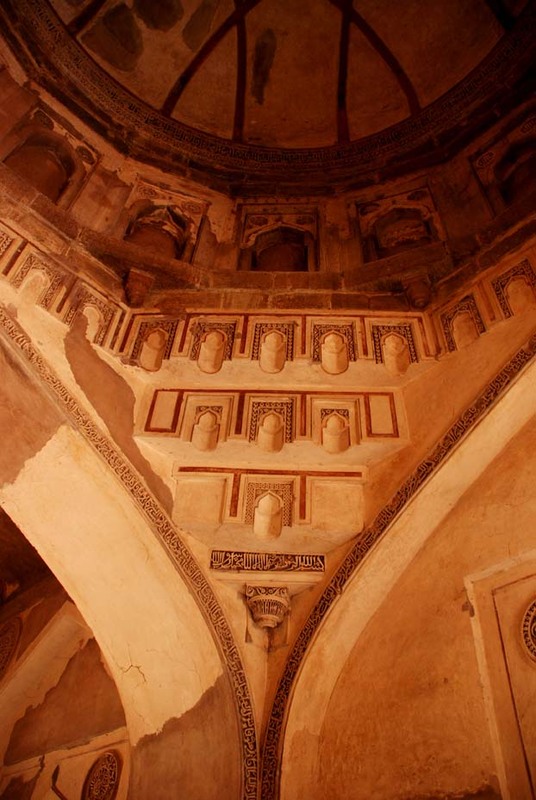 The tomb has often been described as ‘the last flicker in the lamp of Mughal architecture in Delhi’. And this is to go..